An agricultural disaster 40 years ago decimated 500 Michigan dairy and cattle farms and one Michigan city. In the early 1970s, the fire retardant Firemaster BP-6 (PBBs) was produced by the Michigan Chemical Company (McCarty 2010) of St. Louis, Michigan. MCC mislabeled bags of Firemaster as Nutrimaster and shipped the bags to the Michigan Farm Bureau, who mixed the PBBs with livestock feed. The product was distributed to farms across the state and Midwest. Some 1.5 million chickens, 30,000 cattle, 5,900 pigs, and 1,470 sheep consumed the feed and became contaminated with PBBs. Effects included farm quarantines and the destruction of animal feed, chickens, eggs, and dairy products. Over 9 million Michiganders consumed potentially tainted meat and milk for a year until the mistake was discovered. Generational health effects for Michiganders have been documented but are still not fully known. The Velsicol Chemical site is located in St. Louis, Michigan. In the mid-1930s, the 52-acre site housed a lumber mill, oil refinery, salt processing plant, and chemical manufacturing plant. Michigan Chemical Corporation purchased the property in 1935 and conducted chemical manufacturing from 1936 through 1977. A wide variety of chemicals were made at the site including fire retardants (hexabromobenzene, PBB, and tris (2,3-dibromopropyl) phosphate) and pesticides such as dichlorodiphenyl trichloroethane (DDT) and 1,2-dibromo-3-chloropropane (DBCP). Para-chlorobenzene sulfonic acid (p-CBSA), one of the site contaminants of concern, was a byproduct of manufacturing DDT. In 1965, Velsicol Chemical Corporation gained a controlling interest in Michigan Chemical Corporation. Velsicol Chemical closed the site in 1977 and decommissioned it in 1978. The site was razed and buried in place along with the historical production products, oils, brines, and hazardous waste products, including radioactive and rare earth elements. Figure 45. Aerial photographs of the Velsicol Chemical site (Pine River Citizen Task Force 2017, E2 Inc. 2004). Early studies from 1978 to 1980 revealed contamination in site soils, groundwater, river sediments, and fish. To address this contamination, Velsicol, USEPA and the State of Michigan signed a consent judgment in 1982. Velsicol agreed to excavate soils from a nearby Former Burn Area and place them on the main site, construct a slurry wall around the site, and install a clay cap. Velsicol was also released from any liability under CERCLA, RCRA, and state environmental laws for the site, with a limited reopener. The judgement did not require remediation of the contaminated sediments in the Pine River. All the tasks associated with the 1982 consent judgment were completed by 1986. In 1986, as part of a complicated confidential buyout arrangement, Velsicol Chemical transferred site ownership to a Fruit of The Loom subsidiary, NWI Land Management. Fruit of the Loom agreed to assume 100% of the liability for the site previously owned by Velsicol Chemical in an Assumption and Indemnity Agreement. Velsicol continued to manage the site for Fruit of the Loom under a contract with NWI. Fruit of the Loom filed for bankruptcy in 1999, at which point USEPA learned that Velsicol Chemical did not own the site. In 2002, a bankruptcy settlement vested title to the site in a newly established Custodial Trust, which currently holds the title to the property. Some trust fund money became available through FTL bankruptcy settlements and was used to cleanup waste disposal areas and assist with replacing the city’s water supply. However, the site was classified as a Superfund (Fund) Lead site; thus funding is dependent on annual congressional appropriations to Superfund. Figure 45 shows local and regional connectivity around the Velsicol Chemical site and its proximity to the Pine River, a natural resource that serves as a vital economic and recreational hub. 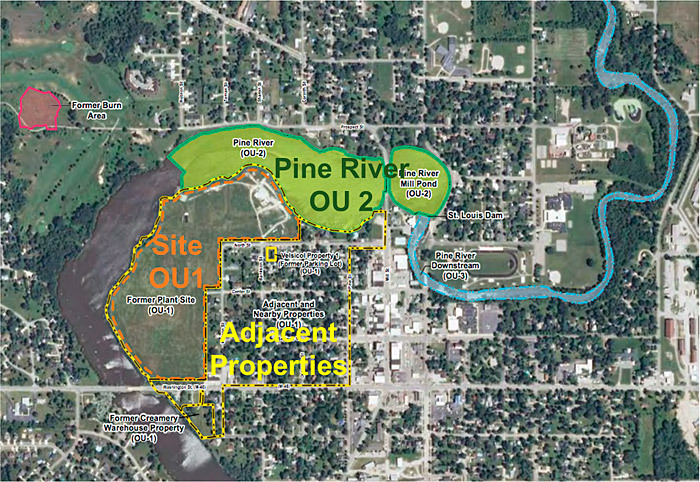 Figure 45 and Figure 46 demonstrate the proximity of the site to the heart of the community and its historical interaction with the Pine River. The former plant site and adjacent and nearby residential properties are both included in OU 1. Nearby properties are separated from the site by a fence. Some of the residential properties had direct contact exceedances for the site chemicals. DDT was present in the residential soils at concentrations high enough to cause acute DDT brain poisoning in robins. Green areas illustrate areas where contaminated sediments were addressed as OU2. Downstream of OU2 is the Pine River Downstream OU 3 (shown in blue on Figure 46), where ecological risk assessment and studies were conducted. The red area in the northwest corner of Figure 46 shows the Former Burn Area, where chemical production wastes from the site was incinerated using open air burning. The Former Burn Area is now a separate Superfund site. Two other related sites not shown on Figure 46 received wastes from the site through illegal disposal. These include farmland south of St. Louis, Michigan, in Bethany Township now known as Gratiot County Landfill and a property in Breckenridge, a small community east of St. Louis. Gratiot County Landfill received PBB waste, other plant-derived wastes, and slaughtered livestock. Gratiot County Landfill is now a Superfund site and continues to conduct monitoring, maintenance, and five-year reviews. Velsicol Chemical Corporation disposed of low-level radioactive wastes in shallow burial trenches at the Breckenridge property following then-applicable Atomic Energy Commission requirements. Subsequently, when the Fruit of the Loom Bankruptcy Trust contractor excavated and removed the low-level radioactive compounds following current Nuclea Regulatory Commission requirements, previously unknown and nonpermitted chemical lab wastes were encountered and subsequently removed by an USEPA emergency response contractor. The initial CSM suggested that the site was underlain by impermeable clay that would prevent downward migration of leachate. This condition influenced the selection of the basic remedy components in the 1982 consent judgement and these assumptions were used as rationale that the 1982 remedy was working. It is now known that the CSM assumptions were false and were based on a flawed remedial investigation rather than scientific evidence. The clay layer under the plant was later determined to be a highly fractured till permeated with sand and gravel lenses. The containment system was installed per the specifications described in the consent judgement, and included a low permeability clay cap, slurry wall to contain leachate on site and prevent contaminants from reaching Pine River, and a leachate collection trench to intercept any leachate produced from buried contaminated fluids. Since the level of leachate within the disposal landfill did not exceed the generous remedial action height standard, the remedial action appeared to be effective. In a 1984 report, Velsicol Chemical concluded that site containment had been successfully achieved. From 1993 to mid-1998, Velsicol pumped groundwater within the slurry wall and disposed of it off site to maintain water levels below levels established by the consent judgement. From 1994 to 1996, USEPA and the Michigan Department of Environmental Quality (MDEQ) noticed increased levels of DDT in fish tissue and sediment in Pine River and began questioning the remedy effectiveness. In 1997, a Final Containment System Assessment Report, commissioned by Velsicol Chemical, detailed the results of the containment system assessment. The report did not document any problems within the slurry wall. The report concluded that 94% of the water infiltrating the cap was migrating vertically through the underlying clay till unit rather than moving laterally through the slurry wall. The report erroneously concluded that the containment system was working as designed. Several factors explained why little leachate was ever recovered from the collection system. As indicated in the 1997 report, the clay cap was not clay and was not constructed properly; therefore, there was significant recharge to the buried plant site. 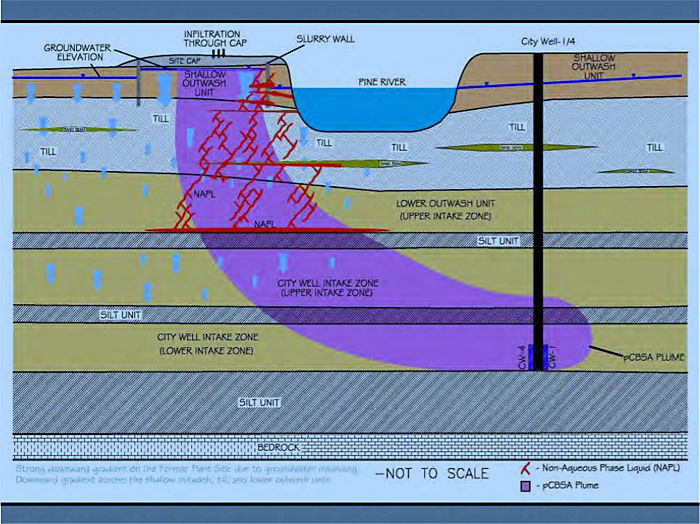 The city of St. Louis municipal well field had created significant downward heads that were confirmed to be present in shallow, intermediate and deep units that form the semiconfining aquifer characteristics. These downward heads caused site contaminants to move downwards to the city wellfield and contributed to the downward and lateral movement of DNAPL and dissolved-phase chlorinated compounds. In addition, the slurry wall was not constructed properly and allowed contaminants to discharge directly off site into the Pine River. Slurry wall boring samples were taken in February 2002; photos are shown in Figure 47 and Figure 48. Slurry was found to not be keyed into the underlying clay layer in some areas; deeper sand and gravel deposits were present beneath the base of the slurry wall in those areas. Gaps in the wall explained the extensive seepage and DNAPL exiting the site into the Pine River. Figure 47. Boring WPZ-10S and WPZ-11S taken in the slurry wall, illustrating gaps in the wall and variation in slurry placement at different depths below ground surface (Weston Solutions 2006). Figure 48. Boring WPZ-11S from 28-30 ft. bgs, showing the presence of gravel (Weston Solutions 2006). Remedial investigations from 2002 to 2012 identified extensive surface and subsurface contamination including soil and groundwater contamination and extensive NAPL and DNAPL pools. An RI report for OU 1 was finalized in 2006. Soils contained DBCP. Contamination is found in the shallow, intermediate and deep aquifer systems. DNAPL has moved through semiconfining units to a depth of 99 feet below the site at a location adjacent to the Pine River (Figure 49). Figure 49. Conceptual contaminant transport model (Weston Solutions 2008). Multiple NAPL and DNAPL disposal areas were identified and found to contain DDT and its congeners. DNAPL was visually identified during soil sample collection and subsequently recovered in quantities from an observation well placed in the saturated unit where DNAPL had been observed. An extensive near-surface DNAPL pool was present close to the Pine River. DNAPL was also present under the Pine River. DNAPL is present in an area of aquifer that transitions from dirty sands to the more permeable regional aquifer system that supplies city drinking water. All remedial investigation wells below semiconfining units had to be double or triple cased to prevent aquifer cross-contamination. A Rotosonic drill was used so that the presence of DNAPL deposits could be observed in the intact sediment core. DNAPL would flow out of the sediment cores. On-site investigation of soils contamination and test pit excavation also identified significant amounts of chlorinated and brominated contamination. NAPL and DNAPL in the unsaturated zone leached dissolved-phase contaminants into the shallow and intermediate aquifers and to the deep aquifer which was used as a drinking water supply. Leachate was also found to be flowing toward Pine River. Two types of DNAPL were discovered at the site. “Hot Spot NAPL” discovered in 2001 contained approximately 70 to 80% DDT, with approximately 10 to 20% chlorobenzene and lesser amounts of benzene. The second type, called “Area 3 NAPL,” was discovered in 2002 in a remediation cell farther west (upriver) that contained brominated and other halogenated organic compounds. The extremely high concentrations of DDT and other site COCs in sediments and fish tissue prompted removal actions in Pine River. From 1998 to 2006, over $120 million dollars were spent to address Pine River contamination. 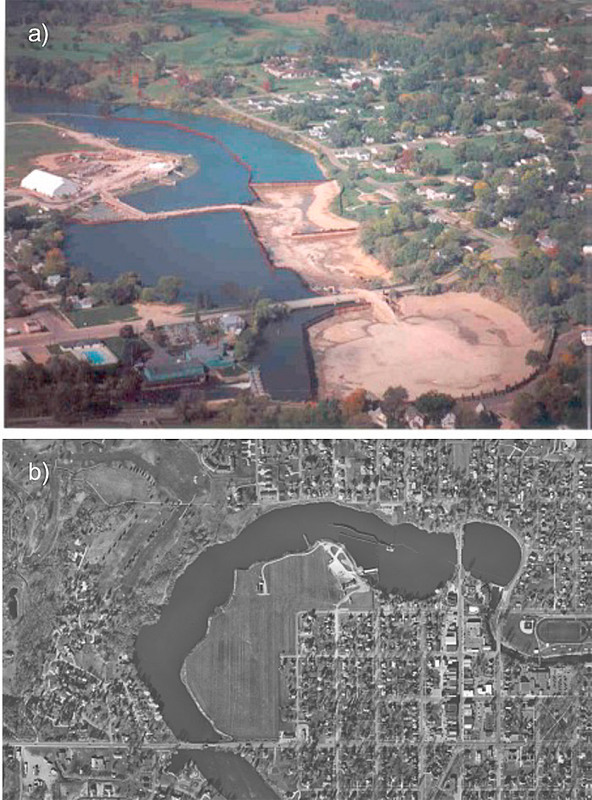 Sediment removal was conducted under an emergency removal action from 1999 to 2000 and was conducted as remediation from 2000 to 2006 (Figure 50). During sediment removal from the Pine River, sand and gravel seams within the till were encountered that contained free-flowing NAPL with high concentrations of DDT and chlorobenzene. Some of the river deposits were full of DNAPL. Figure 50. 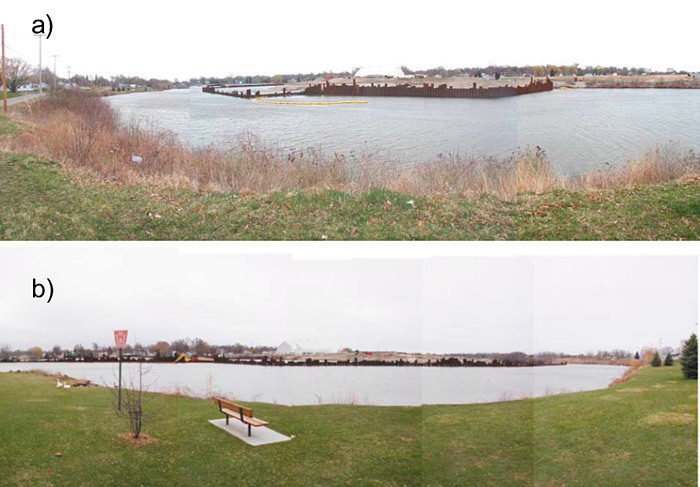 Views of the site from across the Pine River a) in 2003 and b) in 2004, following the Superfund redevelopment initiative pilot project (E2 Inc. 2004). For years, robins had been dying shortly after their return to the Velsicol Chemical site neighborhood every spring. A resident collected dead robins and took them to the Michigan State Department of Natural Resources Wildlife Disease Laboratory for autopsy. Extremely high concentrations of DDT were found in the robins’ brains, spurring a study by toxicologists from Michigan State University, Michigan Department of Environmental Quality, and USEPA. Robins in a nine-block residential area were found to have the highest recorded levels of DDT in brain tissue and acute DDT brain poisoning was found to be the cause of death. This study spurred the ecological cleanup of neighborhood soils as part of the OU 1 ROD. Ecological risk assessment and studies are continuing, with a focus on OU3 downstream of the impoundment. Studies will include the synergistic effects of the multiple bioaccumulative contaminants found in the ecosystem. Bioaccumulatives have already been demonstrated to be present in site mammals, fish, and birds. The objective of these continued studies is to determine whether the ecological risk standard used for the impoundment will need to be lowered to protect the downstream ecological receptors. The 1982 consent judgment between Velsicol, USEPA, and the state of Michigan included the construction of a slurry wall around the site and a clay cap over it. Pine River sediment contamination was addressed at that time by the state of Michigan, which issued a no-consumption advisory for all species of fish in the Pine River—an advisory that remains in effect today. With oversight from USEPA and MDEQ, Velsicol Chemical then constructed and installed a containment system. The slurry wall was set back approximately 50 to 140 feet from the bank of the Pine River. Velsicol Chemical was required to maintain groundwater levels inside the slurry wall and beneath the cap to a specified elevation (724.13 feet above mean sea level). The Former Burn Pit, which had been used for open air burning of hazardous NAPL and DNAPL wastes, was remediated in the early 1980s. Velsicol’s remediation contractor excavated visibly impacted soils from the Former Burn Pit and placed them on top of the main plant site area that was to be capped. These soils contained concentrations of multiple chlorinated compounds well above groundwater protection criteria. At that time, USEPA did not proceed to nominate the Former Burn Pit as a Superfund site. Subsequent investigations performed by the state of Michigan found volatile exceedances of cleanup criteria in near surface soils and extensive DNAPL deposits at depth. After the community pointed out that the Former Burn Pit had been delisted without ever being listed in the first place, USEPA reviewed the data and the Former Burn Pit was added to the NPL. The Former Burn Pit ROD identified thermal treatment to address DNAPL at depth, followed by groundwater monitoring to determine thermal treatment effectiveness. USEPA funded sediment cleanup and removed over 750,000 cubic yards of DDT-contaminated sediment, which was disposed of in an approved off-site landfill. Dry sediment removal was conducted by driving interlocking sheet piling down the center of impoundment zones (shown in green on Figure 46), dividing, and dewatering half of the Pine River and performing sediment removal actions. Once completed, river flow was restored on the remediated side and the other, contaminated, side was dewatered so that dry excavation activities could be completed. As a result, DDT levels in fish tissue decreased by over 98 percent, downstream of the city dam. The state of Michigan plans to keep the fish advisory in place until the entire site has been remediated. In response to discovering migration through the slurry wall, USEPA undertook an interim response action in 2002 to prevent recontamination of the Pine River by future migration of DNAPL and contaminated groundwater from the site. Collection trenches were constructed in the top of the till unit underlying sediments along the Pine River shoreline where DNAPL had been observed. 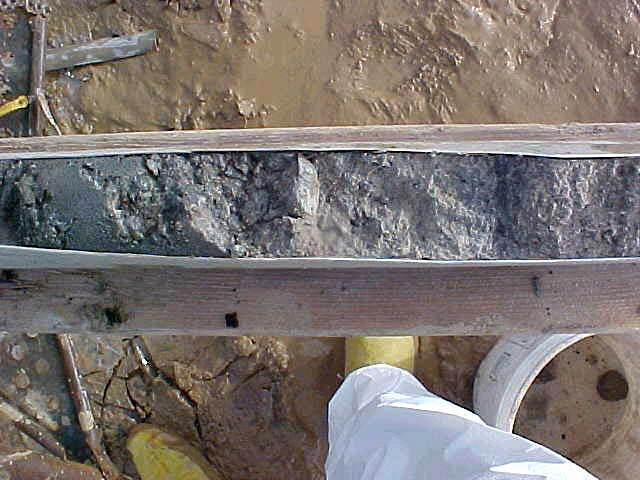 In addition to the collection system, a layer of compacted clay at least two feet thick was placed on the till unit to cap areas within the sediment removal cells where DNAPL-impacted till remained (Figure 51). Figure 51. Aerial photographs of the site a) during sediment removal in 2002 and b) after sediment removal, showing cap cover (E2 Inc. 2004, modified from Heidlauf 2017). Excavate and remove on-site sources of concentrated contamination where practical; use in situ thermal treatment or in situ chemical oxidation in areas where removal is not practical. Install sheet piling to separate the impoundment from site wastes. Operate the leachate collection system inside of the site wall and keep leachate levels consistently below the elevation of the Pine River. Continuously operate a groundwater P&T system to reduce off-site groundwater contamination and to control the loss of dissolved-phase contaminants from DNAPL pools residing under the Pine River. Restore aquifers beyond the site boundaries, except for aquifers under the Pine River impacted by DNAPL. A TI waiver was used to acknowledge that the groundwater under the river and near the DNAPL pools would not be remediated to drinking water standards. The full extent of DNAPL under the Pine River has not been investigated or characterized. The removal of 3,000 gallons of product from an open pit, where it accumulated, did not reduce or change the DNAPL elevation. Extensive deposits of DNAPL are therefore present under the Pine River. The ROD stated that DNAPL pool remediation was technically impracticable. DNAPL is collected from the trench when the site remedy is operational. Currently, both NAPL and dissolved-phase groundwater is collected from the trench and is sent off site for disposal. It is assumed that the dissolved-phase contaminants in the permeable sand and gravel lenses in the till will be captured and controlled by a site groundwater P&T system that has yet to be installed. By 2016, soil removal actions from residential areas were complete. The risk to the city drinking water supply was addressed by shutting down the city well field and bringing in a source of clean water for the city residents. The new water supply was brought on line in the fall of 2015. When the city well field was shut down, the area rapidly returned to flowing (artesian) conditions. Residential wells at the city limits are now flowing. The rapid return to flowing conditions was not anticipated since expectations were that the aquifer would never flow again. These conditions are expected to be alleviated when the site P&T system goes on line. However, as there are no funds to implement the remedy, these conditions may present to new risk to Pine River and city residents. It is too soon to know if there will be new contamination problems due to the rapid rise in head levels under the city. USEPA and MDEQ are also in the process of completing remedial investigation downstream of the former chemical plant property for the new operable unit, OU 3. The community has been involved with the cleanup process since cleanup work began on the former Velsicol Chemical Corporation site. Over the past several years, USEPA and MDEQ have taken steps to increase communication with the city, Community Advisory Group (CAG), and community members. The CAG, formally known as the Pine River Superfund Citizen Task Force, was formed in 1997 by residents in and around St. Louis to connect community members with government and technical experts. The CAG holds monthly meetings and maintains a website with overviews of the community’s experiences with the site. USEPA and MDEQ attend these meetings to provide site-related updates, answer questions, and address concerns. The MDEQ and USEPA have conducted multiple rounds of community interviews with St. Louis residents as well as with CAG members to gain insight into the community’s primary concerns, how they viewed engagement efforts, and how USEPA’s community involvement plan (Participedia 2017) could be improved. The responses have informed updates to the CIP which was written to outline ways to enhance community engagement in decisions about the site. Community engagement is an important component of ongoing cleanup efforts. USEPA actively communicates with residents throughout the cleanup through regular public meetings, newsletters and email updates. During the removal action, USEPA developed an excavation plan based on residents’ input concerning dust, noise, and traffic disruptions; the plan included steps for dust suppression, air monitoring, and treatment and control of toxic surface and groundwater. The residential cleanup required removal of contaminated soil from private properties, which necessitated extensive communication between USEPA and property owners. After the contaminated soils were removed, the properties were relandscaped with new sod, trees, and flowers. USEPA and MDEQ continues to work closely with the community as cleanup continues and work with the City on opportunities for redevelopment of the former plant site.